Los Angeles, April 12: Actors Jeremy Renner and Paul Rudd have found a fun way to avoid spoilers as they promote "Avengers: Endgame" during the film's press tour. When the actor stopped by "Jimmy Kimmel Live!" on Wednesday, Renner explained that promoting the upcoming "Avengers" film has been difficult because they can't talk about it, reports hollywoodreporter.com. Kimmel then shared a photograph that Renner previously posted on his Instagram account of a movie poster for a fake film called "50 Year Old Virgins". Renner and Rudd embraced each other in the image, which said that the film is currently in theatres. Road to Avengers EndGame: From Jeff Bridges in Iron Man to Brie Larson in Captain Marvel, All Oscar Winning Actors in MCU, Ranked Based on Impact. 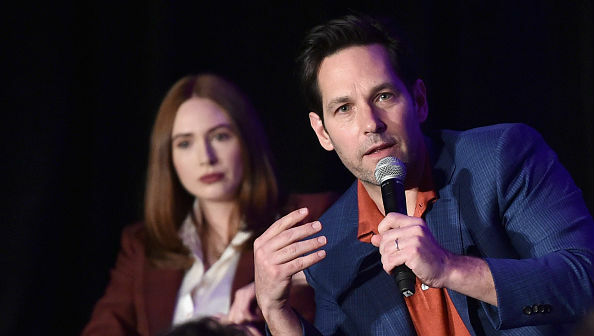 Avengers: Endgame: Paul Rudd Reacts to That Ant-Man & Thanos Fan Theory. "Paul and I decided during the part of this press tour to make up a movie that we're in that we actually could talk about," he explained. "So we're 50-year-old virgins and we can speak about that all you want." Avengers EndGame New Trailer: 11 Interesting Details You Might Have Missed in Marvel's New Promo.